After surviving 100 years of change, this rare building has been "gutted out"
"It didn't succumb to the vagaries of fashion." A BUILDING FROM the late-19th century that was earmarked for conservation has been “gutted out” by its private owners. According to Dublin’s Civic Trust, an organisation which aims to protect the city’s architectural heritage through raising awareness, the J Dempsey building on Dorset St was completely intact and unaltered last year, but has since been cleared out. It represented a type of building that has all but vanished across the city, and featured a shop at the front and private living quarters at the back and upstairs. The timber fitments from the shelves and counters were all remarkably intact. The site had been earmarked by National Inventory of Architectural Heritage (NIAH) because of its unique historic importance. 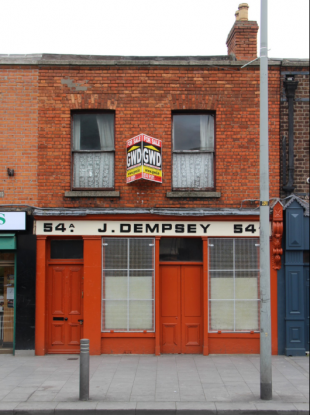 …one of the best traditional shopfronts on Dorset Street. While such commercial premises were commonplace, the evolving nature of the busy street means that Dempsey’s is a unique building within the streetscape. This particular building was built between 1870-1890 and was one of the last Victorian buildings of its kind in Dublin. [It didn't succumb] to the vagaries of fashion – not only did it withstand the influence of the 1950s and 1960s, but the boom-time period as well. It was a standing example of continuity that the shop survived over 100 years with almost no later interventions. In style with the living arrangements of the time, bedrooms were above the shop face, with a kitchen at the very back of the shop. In most areas the upper storey survives but the shop does not. J Dempsey was one of the few Victorian shops with a preserved shop interior. The building had various intriguing features – including remarkably well-preserved shop counters with original Victorian diagonal tongue-and-groove timbers (above), original gas lighting upstairs, an original stove inset into the chimney breast with glossy ceramic bricks around it, and the limewashed garden walls. According to Hickey, the back wall and shop front are all that remain of the building that had been preserved for over a century. It was completely stuck in time. It’s galling to see it vanish in the way that it has. NIAH systematically surveys buildings across the country – they are currently surveying Dublin city. The J Dempsey building had been flagged as historically unique, and was submitted in a series of recommendations for conservation. Hickey said that the failure to add the J Dempsey building as a protected structure “highlights the urgency of speeding up the NIAH process, which really is a very slow process”. He also said that it had not been flagged at all with the owners of the building, and there was no statutory obligation to tell the owners if a building is culturally or historically significant. The new owner legitimately bought the space and carried out works inside. They demolished the upper floor and the shop. Dublin’s “wealth of architectural heritage” is worthy of a closer look, he argues, saying that the “value of vernacular streetscape is often overlooked”. The shame is really in how it could’ve been used – a wonderful home for a family, or an authentic rather than a fake hipster café – this was the real deal. Email “After surviving 100 years of change, this rare building has been "gutted out"”. Feedback on “After surviving 100 years of change, this rare building has been "gutted out"”.